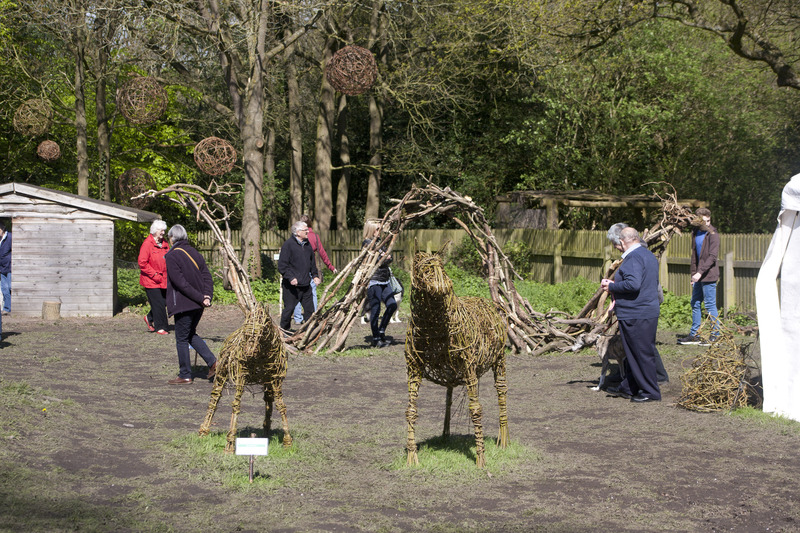 Ten Artists celebrated art and nature in this temporary woodland sculpture exhibition. 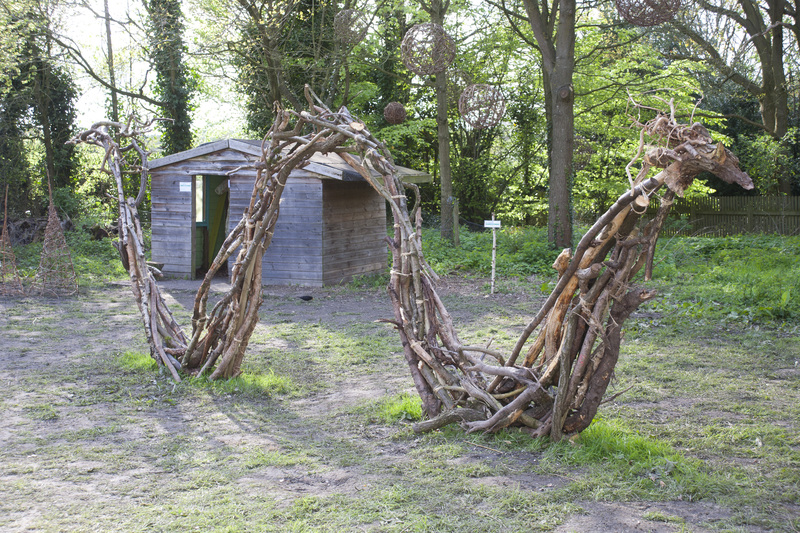 They made work in response to the Outwoods and the natural rhythms of our environment, some of which was created on site in the lead up to the exhibition. 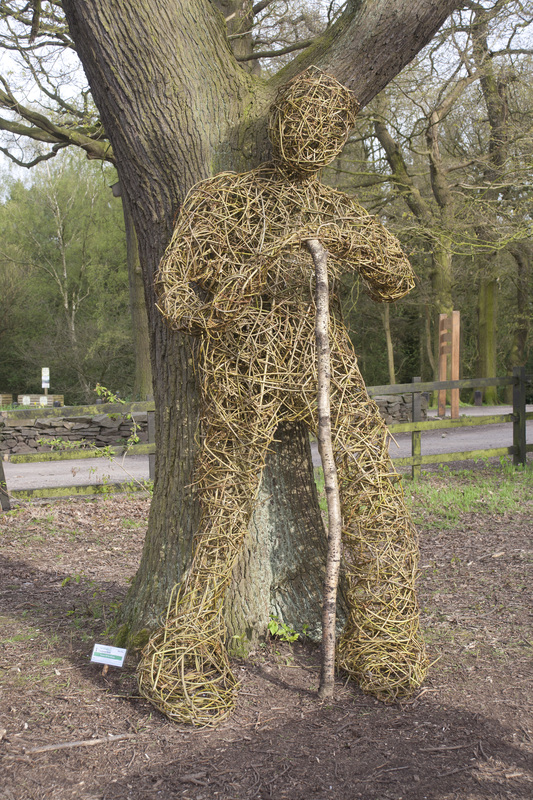 Better known for her paintings, Jo Sheppard used the Outwoods Sculpture Week as an opportunity to produce three dimensional work using willow. 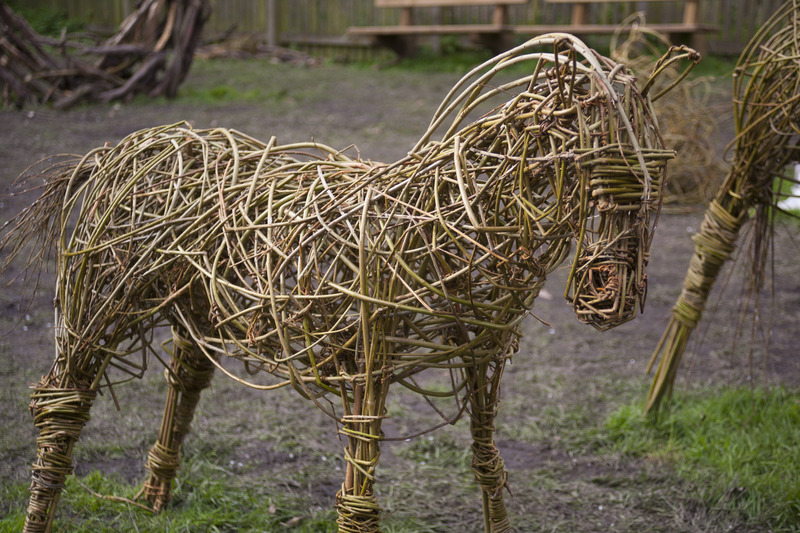 Inspired by her love of horses, she produced a brood mare and foal using a sustainable sculptural process (as it is made purely from willow with no metal frame or support structures). Me and My Boy, Foal. Me and My Boy, Mare. 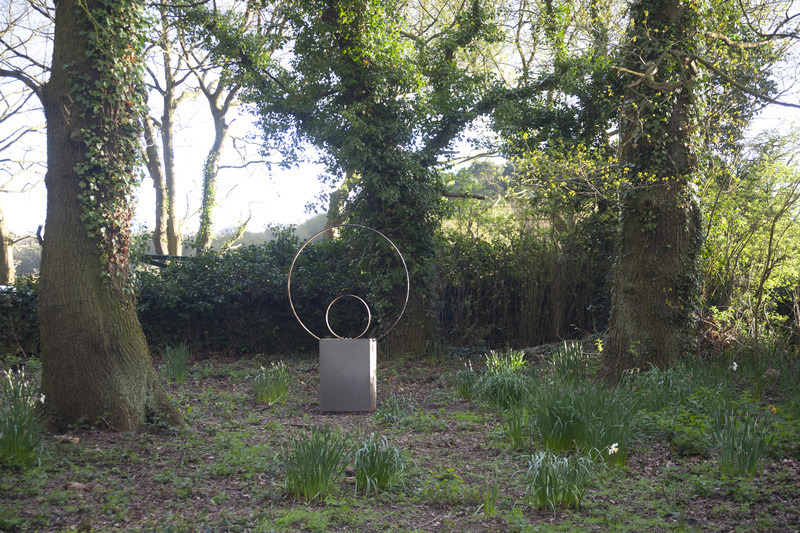 My work is mainly about the interlinking of the terrestrial and the celestial and a reverence and humility in the face of Nature. 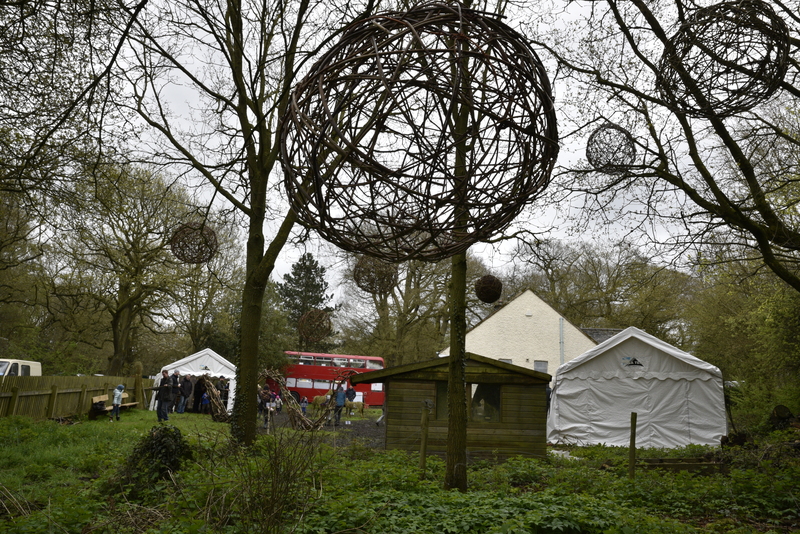 I have exhibited in three ‘Sculpture in the Garden’ exhibitions at National Trust properties. 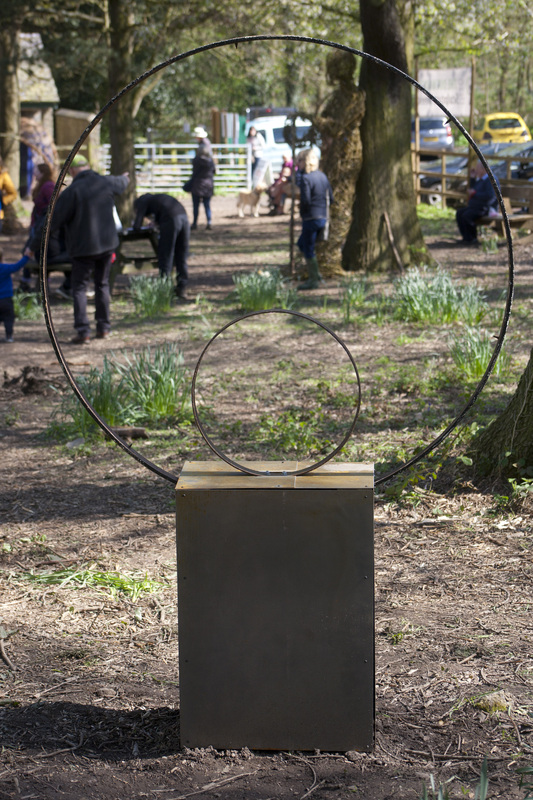 The Outwoods Sculpture Week has enabled me to work on a larger scale and is a continuation of a piece I exhibited some years ago called Matter and Material. Taking Root. 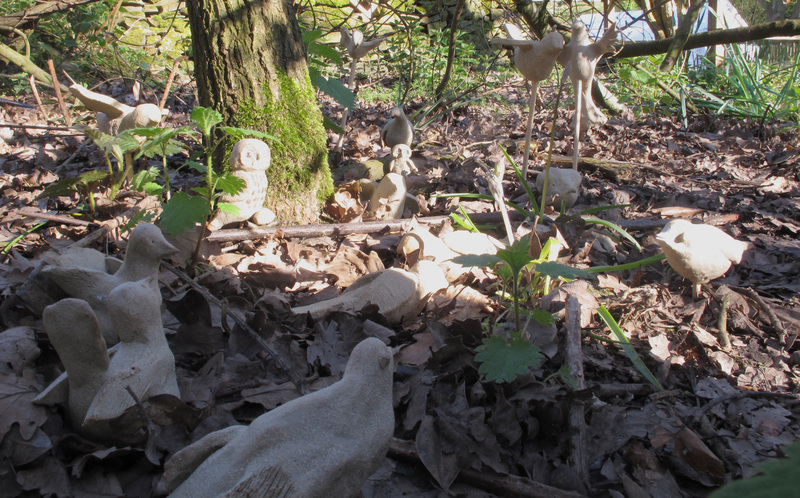 In our cycle of decay and transformation old bones become new shoots, symbolic of healing in our chaotic world. Walk into the space of stillness within, walking through or crossing over, this can be our renewal. As stone turns to sand and sand turns to stone with the passing of time, so our world is in a constant state of flux and renewal. I hope my work is an echo of this. 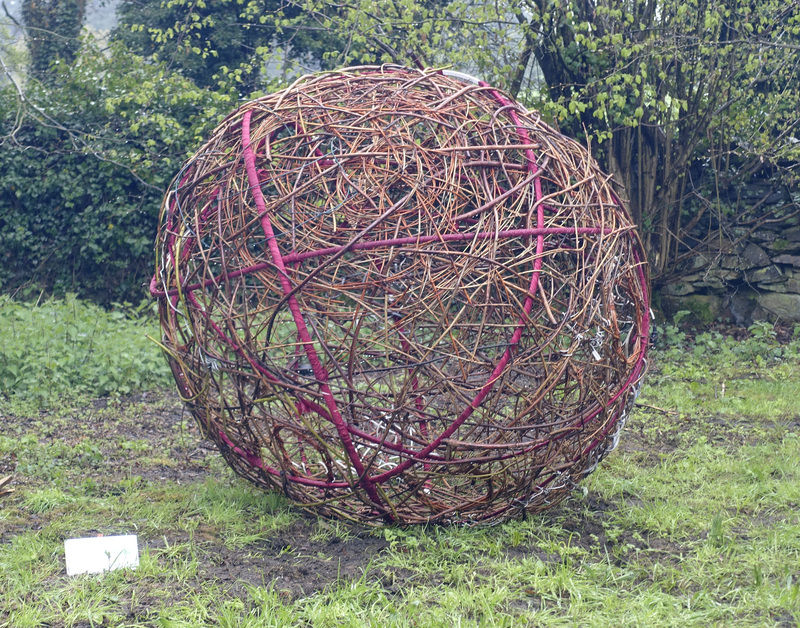 Through working with willow and natural materials I have become ever more aware of the cycles of change within the natural flow of the world around me. 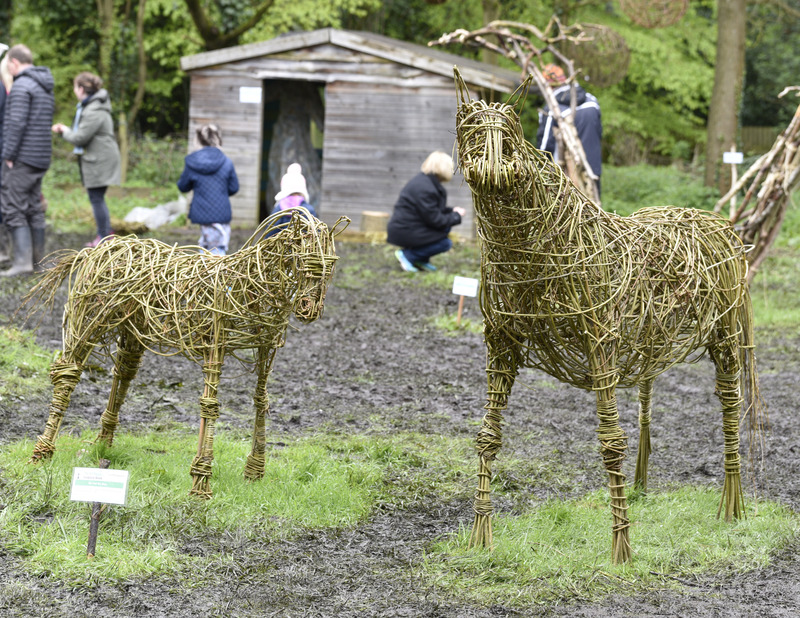 To be able to combine art and nature for the Outwoods has been a joy. Unity Of Time. 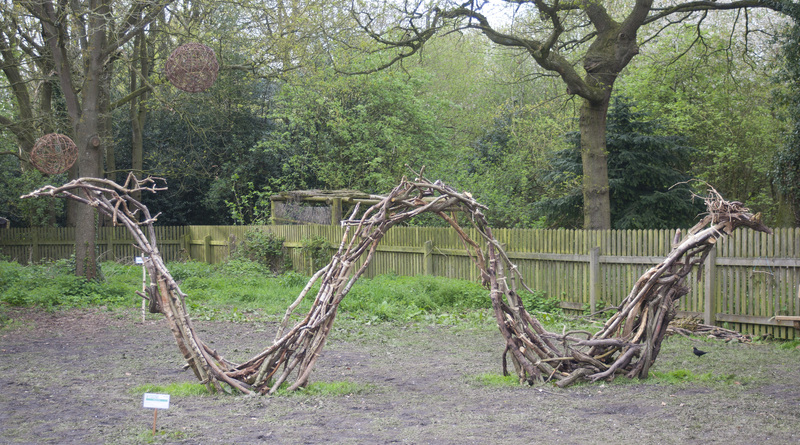 The serpent looks to the future and to the past while existing in the present moment. 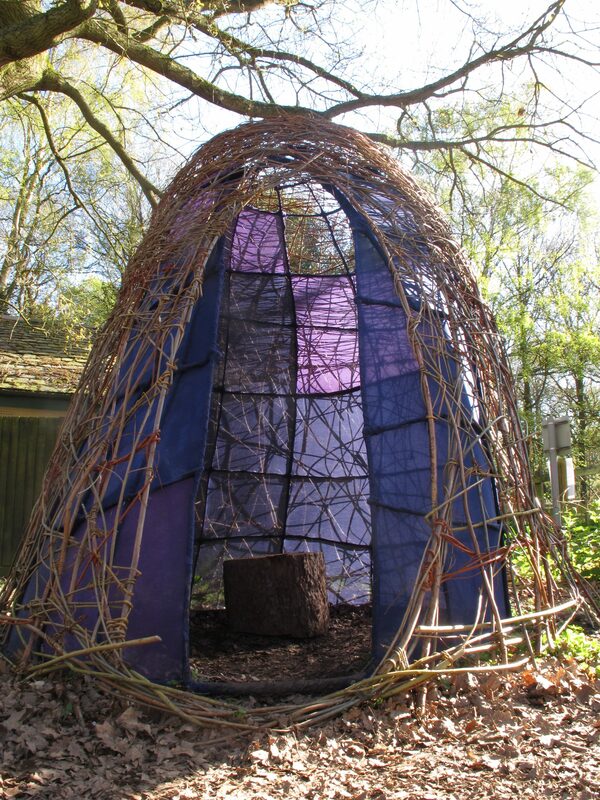 Made on site from natural woodland materials. Keeper Of The Woods. Willow. Inner Stillness. Walk in and sit down, take a moment away from the chaos of everyday life. 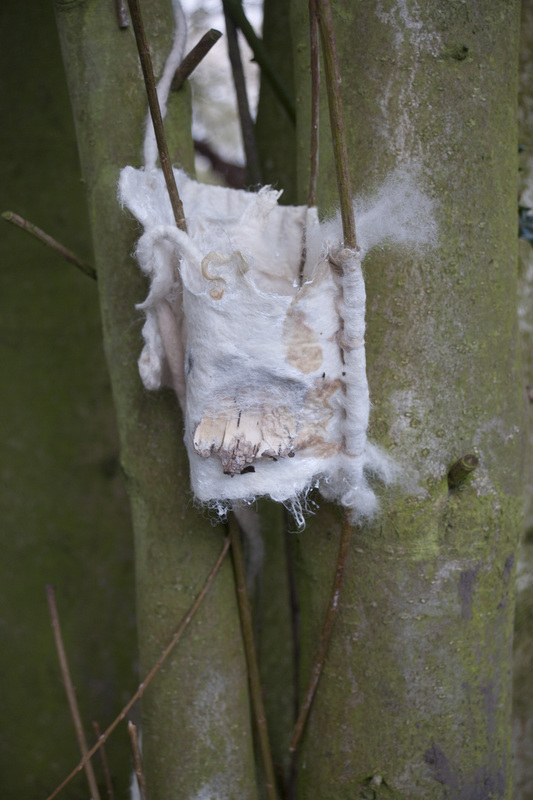 Willow, muslin and wood. Guardian Angel. 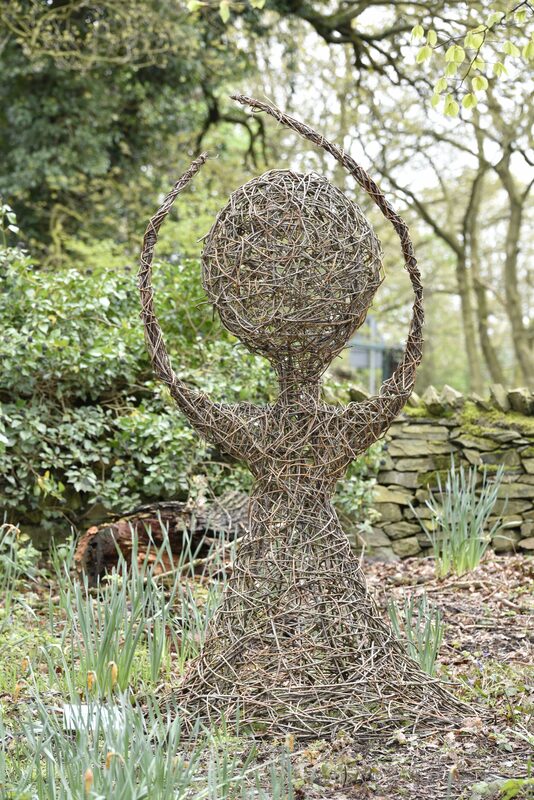 Willow and steel rod. Changing World. Technology : Is it taking over or making the world a better place ? 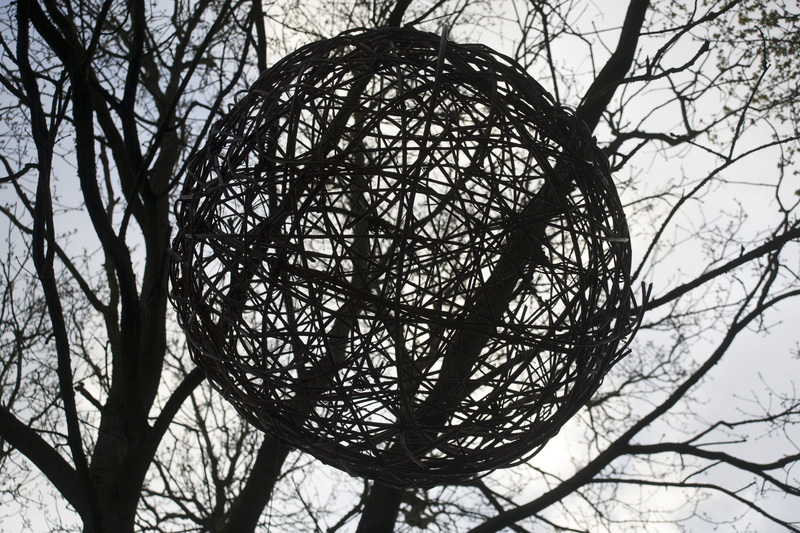 Willow, electrical cable and plastic. I have a background in graphic art and a degree in printmaking. My printmaking and my painting work focuses on nature and the environment. 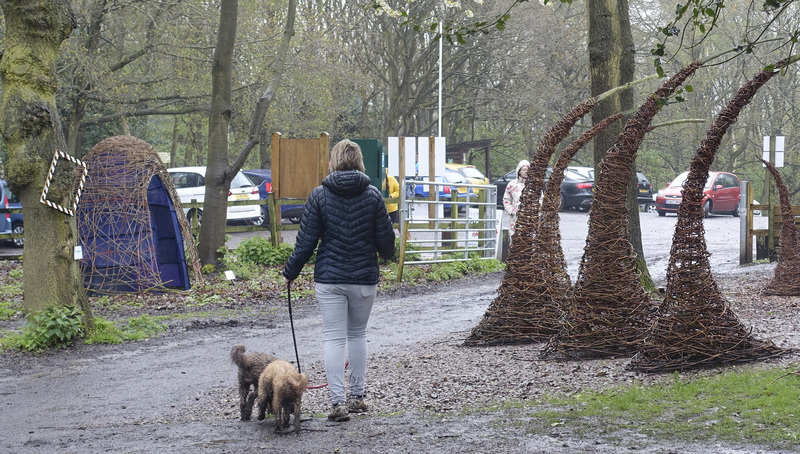 I have always had a keen interest in the crafts and knitting has enabled me to create these tree stems. 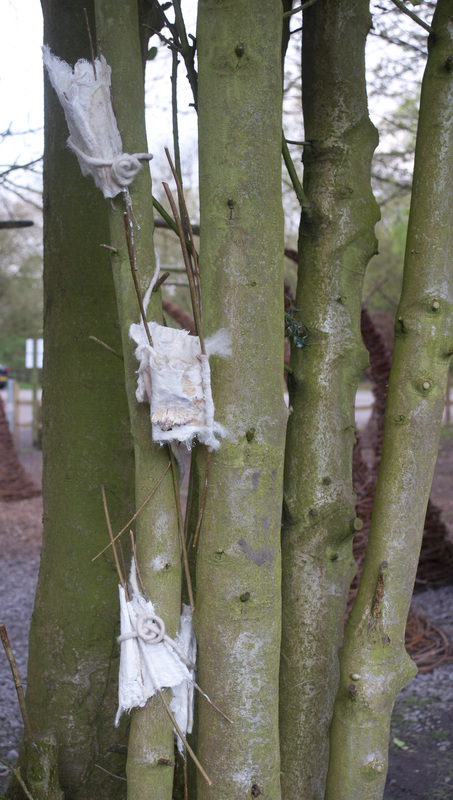 I have made an interpretation of tree trunks with their roots and the textures of bark. Pine Cone. 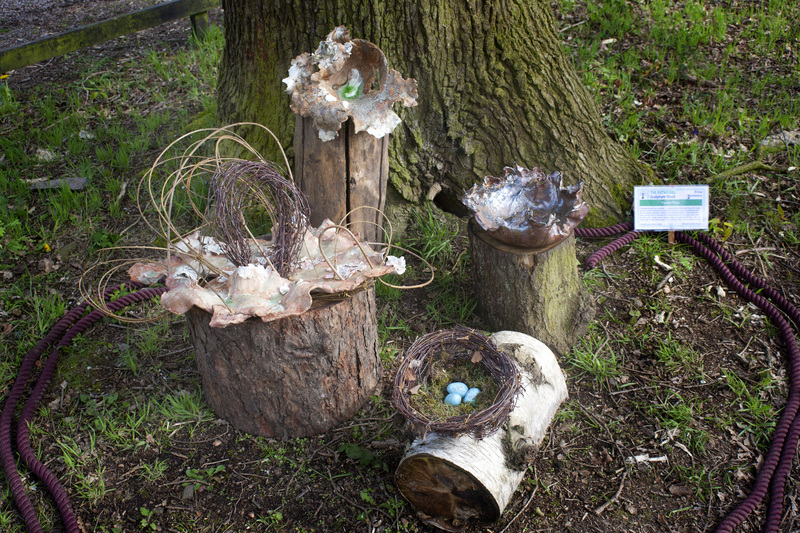 Raku ceramic and Outwoods pine cones. This piece is made from cones of crank clay and low fired using the ancient technique known as Raku. 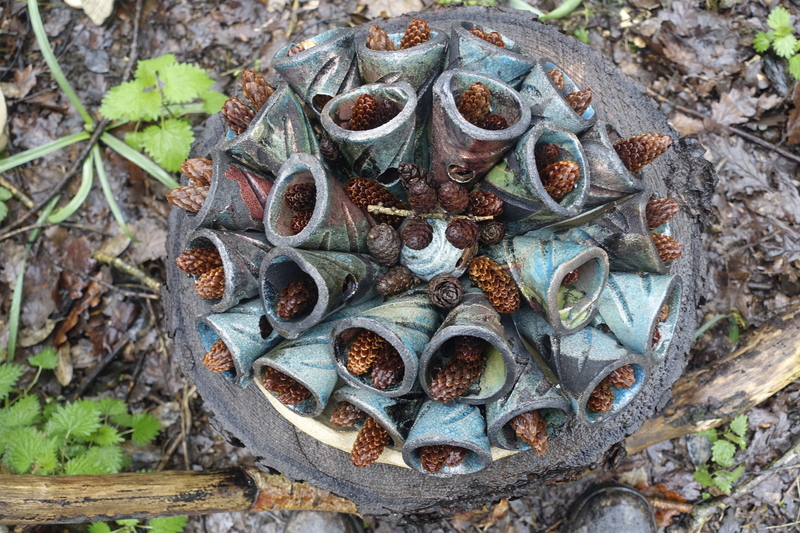 The cones are set in a stoneware tray and contain cones collected from the Outwoods. 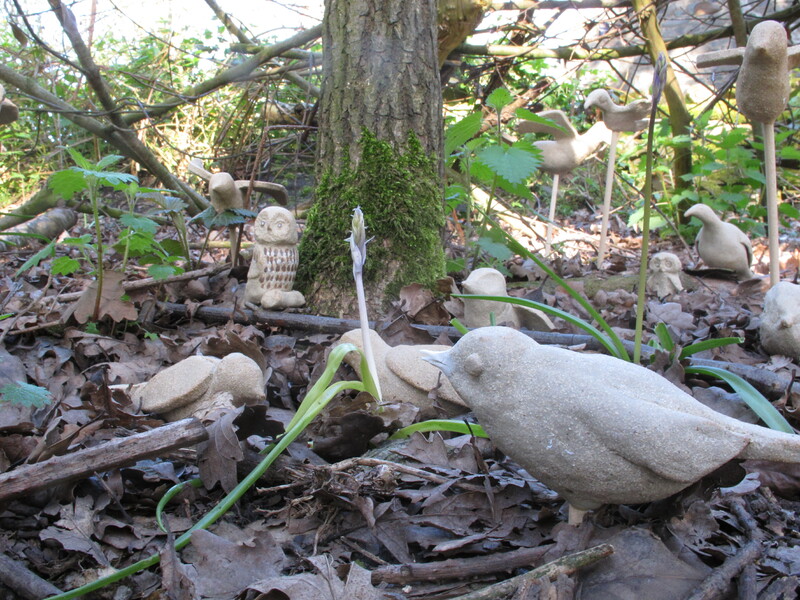 Sally Reayer and others: ‘Ceramic Woodland Birds’ This installation has been created cooperatively by a small group of artists during a skill share workshop. 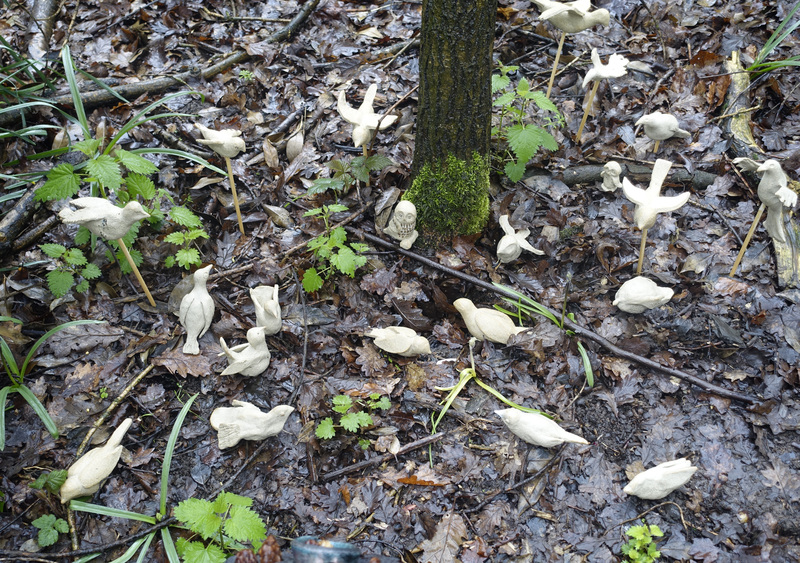 The birds are made from crank clay and fired to stoneware temperature without glaze. 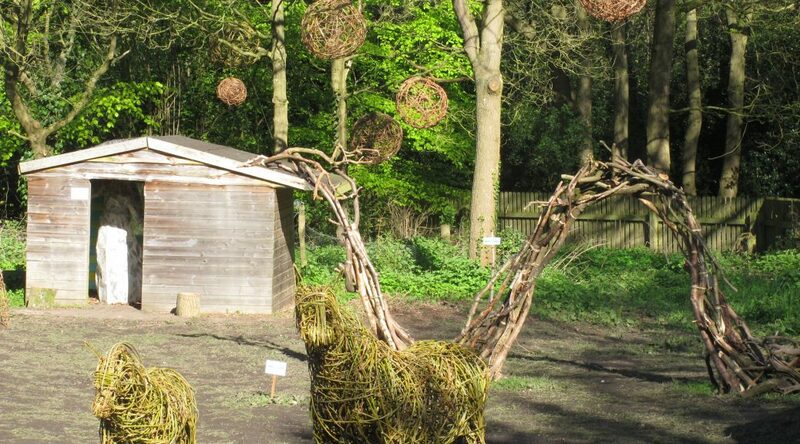 They represent and celebrate a range of British birds which reside in the Outwoods. To draw the eye. 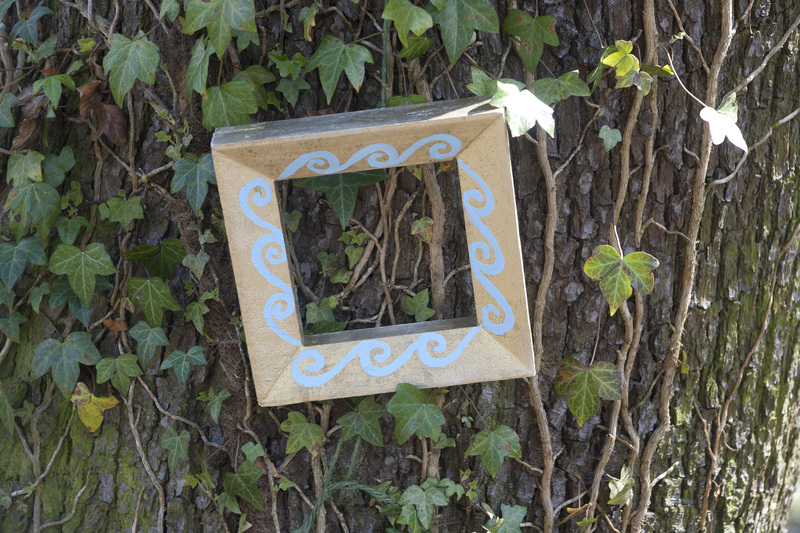 Painted recycled frames. 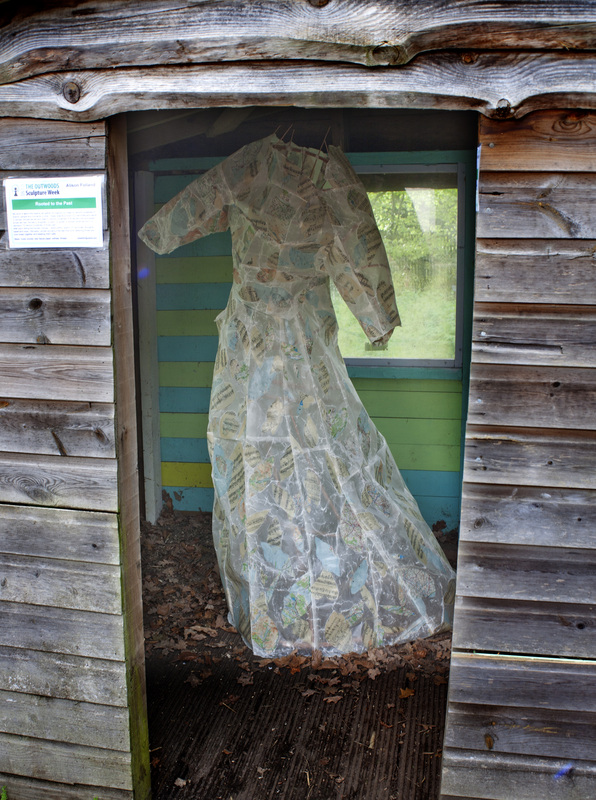 Sally Reayer and others: ‘To draw the eye’ . Take time to stand and stare. Take time to stroll and listen. 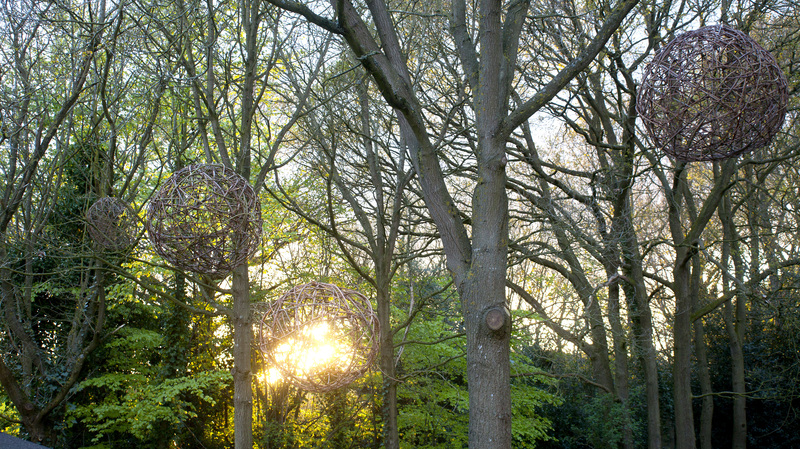 Take time to enjoy the sounds and the scents of the woodland. Free yourself from the noise and rush of life if only for an hour. 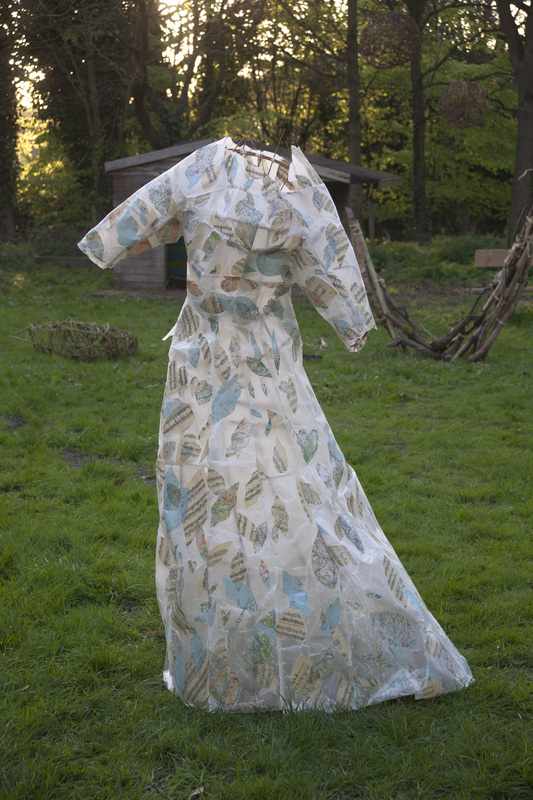 My work is about the objects we gather throughout our lives, to remind ourselves of events, people and moments in time. These objects prompt our memories and result in stories. Stories we tell and retell to remind ourselves of those we love and experiences we had. Stories to enlighten, to warn, to guide, to explain what we don’t understand. To remind ourselves of times past. With each telling the stories change – layers within layers, of memories, thoughts, belief and hope. 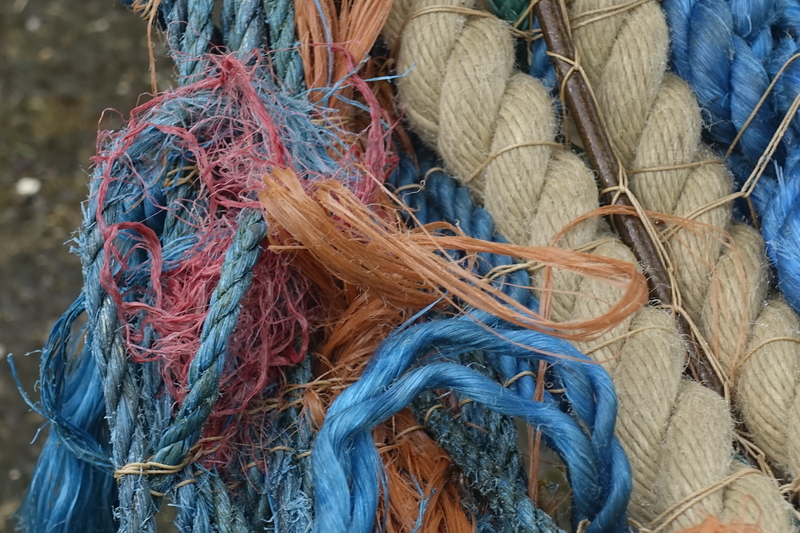 Ultimately, stories are about the ties that bind; weaving those you love closer together and keeping them safe. 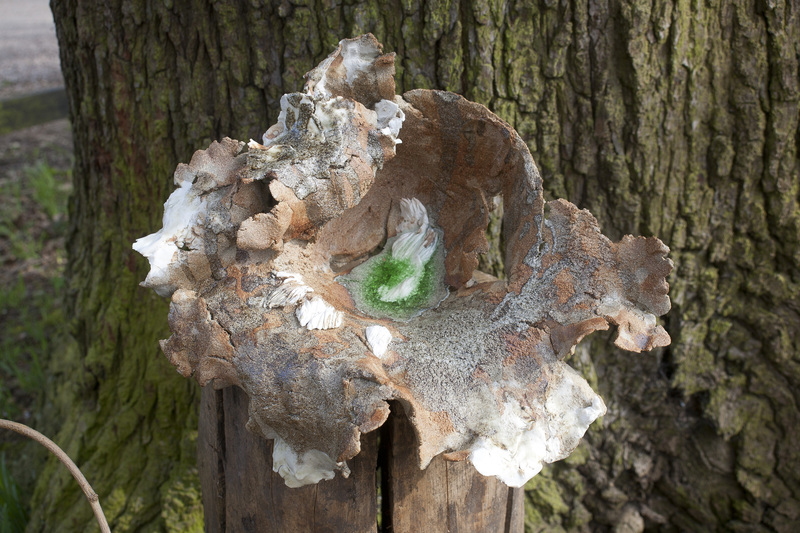 ‘Forest Floor’ – ceramic and mixed media. 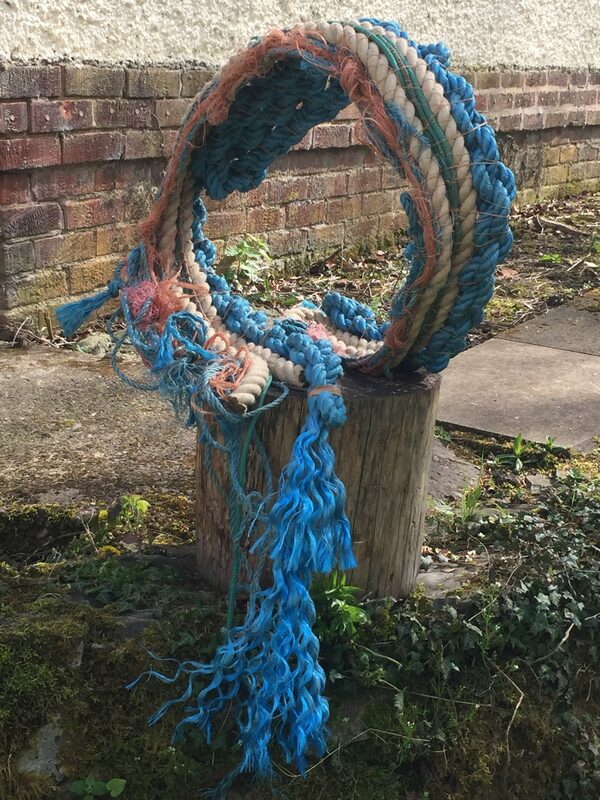 Originally trained as a painter, I’ve approached this new foray into sculpture as a three- dimensional extension of some of my 2D painting work which explores painterly surfaces and characteristics. 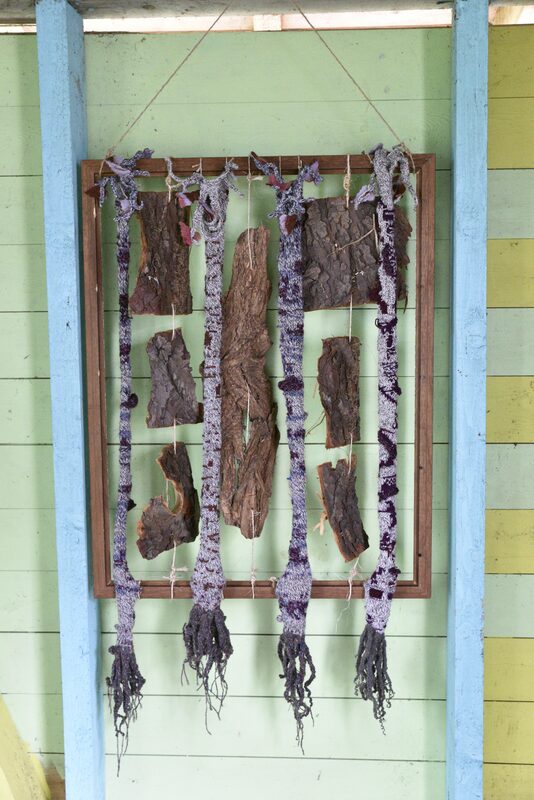 This three-part work echoes forms, textures and colours found on the forest floor such as bark, rock, fungal growth, twigs, holes and general detritus. 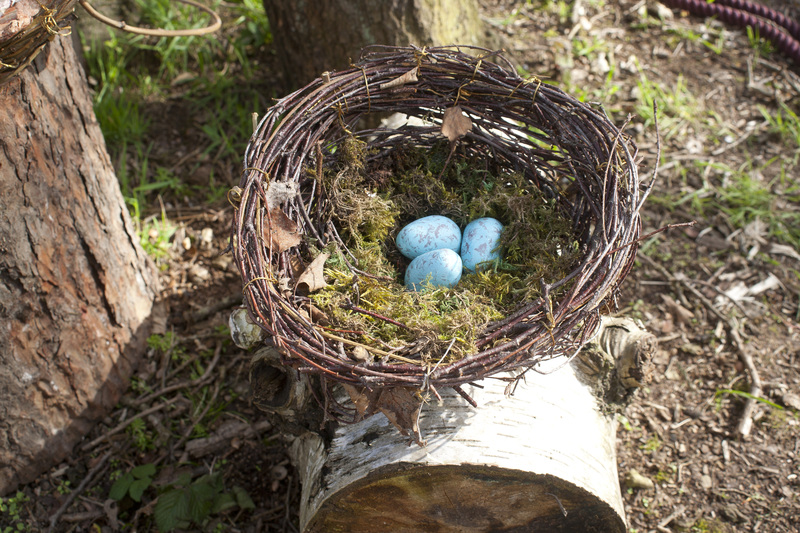 The out-sized robin’s nest stands apart, but is linked in form via the arched twigs. 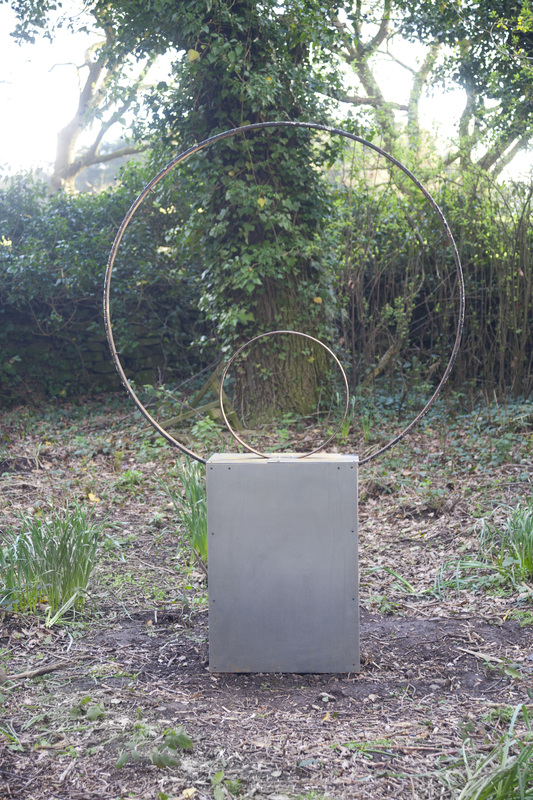 Involute (Homage to Hepworth). 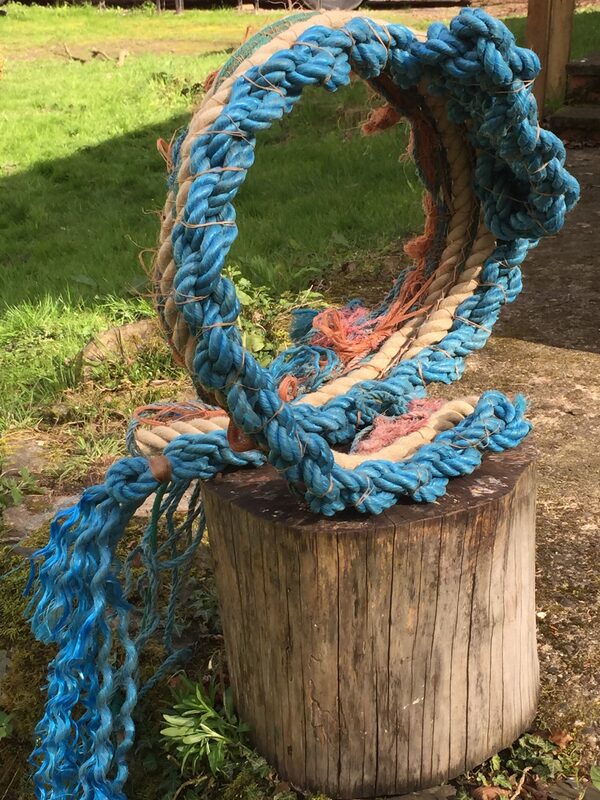 Rope, mostly recycled, whipping twine and steel. 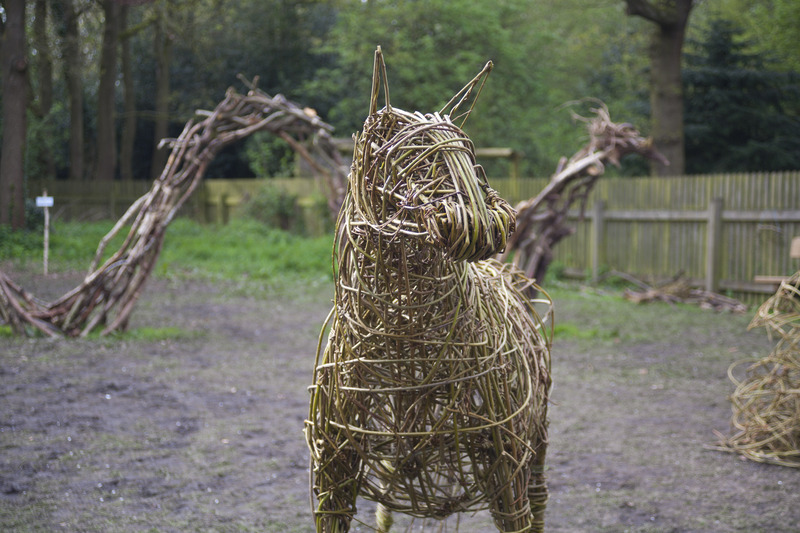 I am usually a 2D artist and this is my first venture into sculpture. 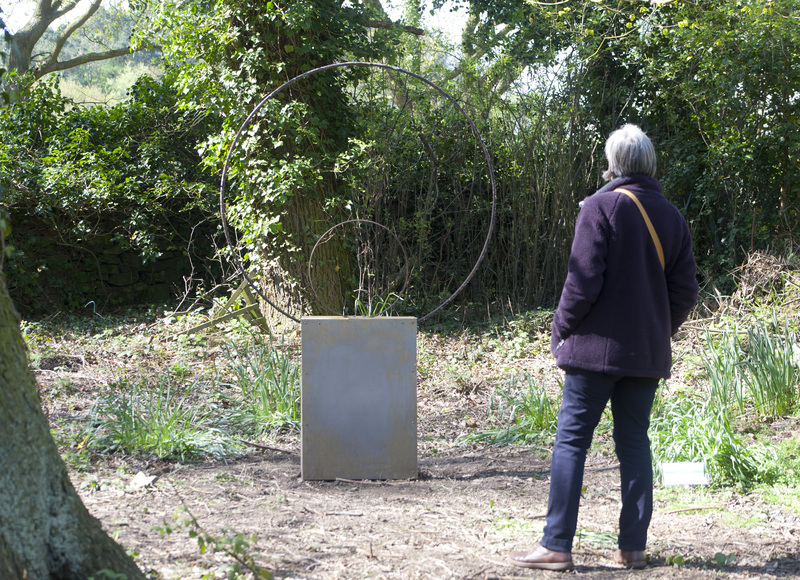 This work is inspired by waves and by Barbara Hepworth’s sculpture of the same name. Bark. 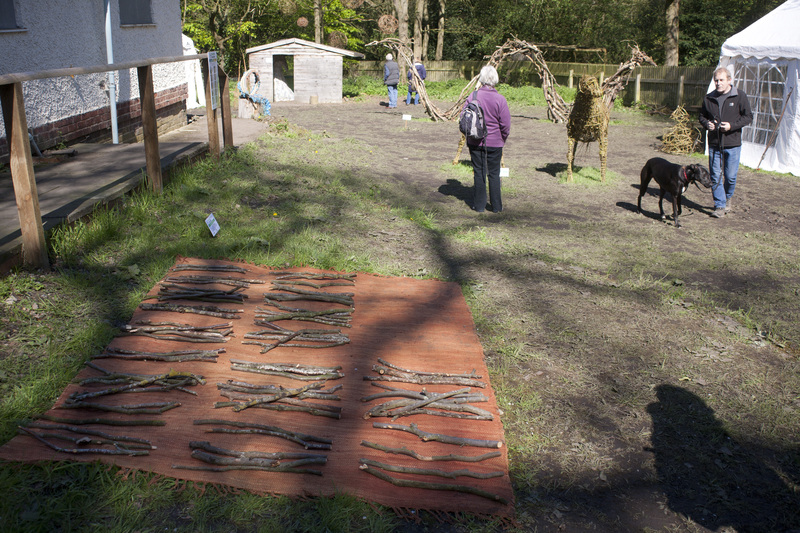 Felt, bark and twigs. 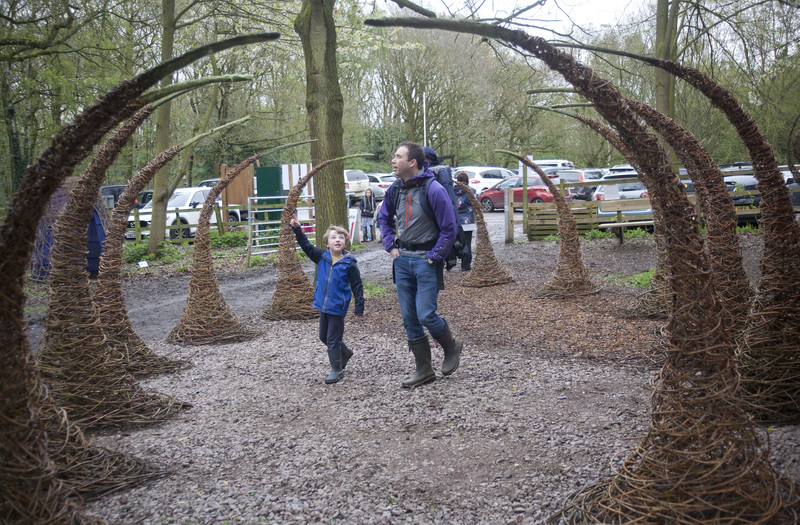 Sculpture inspired by walks through the Outwoods. Stopping and looking around me, observing beautiful bark found on the trees and woodland floor, taking in the beauty of the natural landscape. Created using hand wet felting techniques, mixed media and willow. 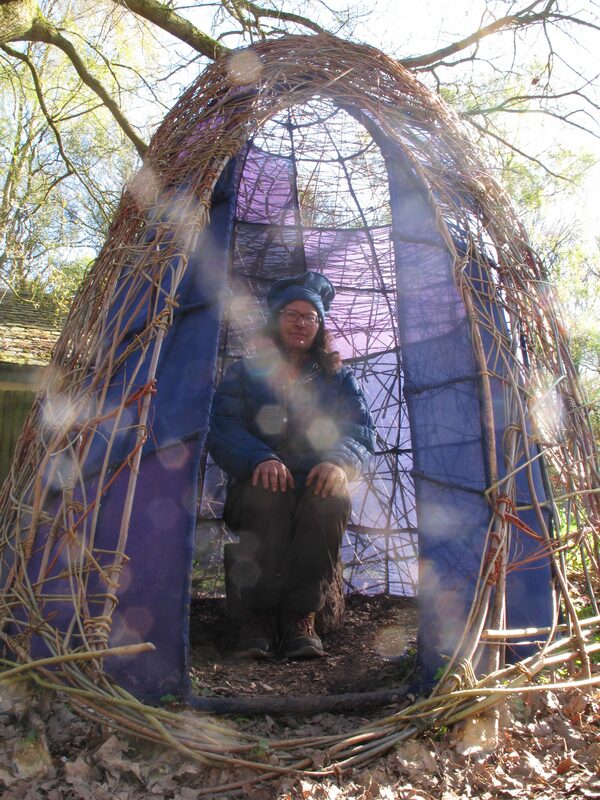 Sue is a mixed media artist who has worked as a Community Artist, across the East Midlands, for 25 years. “Counting Blessings II”. 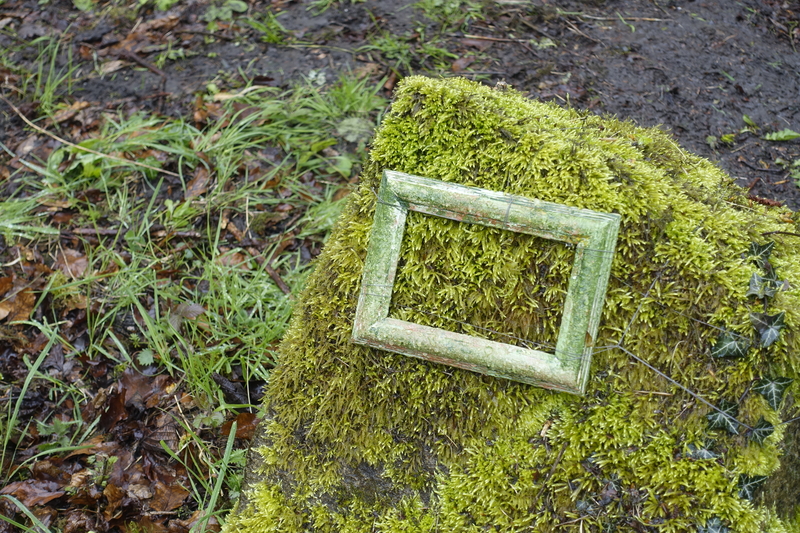 Found objects. There is so much to enjoy in the woods but it’s hard to stay in the moment and focus on the present. When in the present for long enough to hear/see/smell/feel something special Pam rewards herself by picking something resembling a tally stick off the ground. 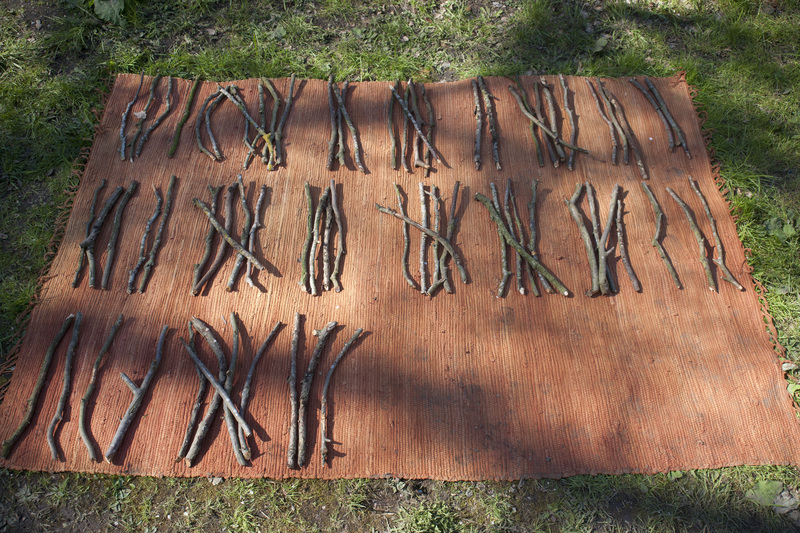 For the last few weeks she has collected sticks in this way and has arranged them appropriately to see how well she can discipline her mind.